Automation found its first regression for Fennec! 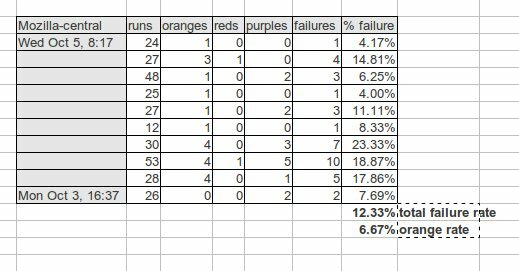 Yesterday I noticed our Mochitest-1 test was orange (since Nov 17th…still need to train others to watch the results), so I spent a few minutes looking into it and it turned out to be a regression (which was promptly fixed by the mobile guys!) I know automation has uncovered errors in the past, but this is the first time we have had automation that was truly green for a week (we just turned it on) and then turned orange as the result of a unfriendly patch. I have been working on a project to get mochitests running on a build of Fennec + electrolysis. In general, you can follow along in bug 567417. One of the large TODO items in getting the tests to run is actually fixing the tests which use UniversalXPConnect. So my approach was to grep through a mochitest tests/ directory for @mozilla and parse it out. 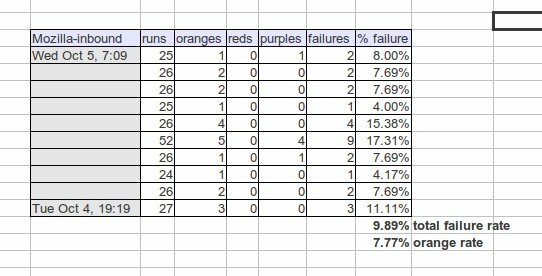 With a few corner cases, this resulted in a full list of services we utilize from our tests (here is a sorted list by frequency 76 total services.) Cool, but that didn’t seem useful enough. Then I took my work that I have done for filtering (the json file) and cross referenced that with my original list of tests that use UniversalXPConnect. Now I have a list of 59 services which all should pass in Fennec (a mozilla-central build from 2 weeks ago on n900) along with the first filename of the test which utilizes that services! What else would be useful? One project which I am working on is getting mochitests to run in fennec + electrolysis. Why this is a project is we don’t allow web pages to access privileged information in the browser anymore. Mochitests in the simplest form use file logging and event generation. The communication channel that is available between the ‘chrome’ and ‘content’ process is the messageManager protocol. There are even great examples of using this in the unit tests for ipc. Unfortunately I have not been able to load a normal web page and allow for my extension which used messageManager calls to interact. I think what would be nice to see is a real end to end example of an extension that would demonstrate functionality on any given webpage. This would be helpful to all addon authors, not just me:) If I figure this out, I will update with a new blog post. In many of my previous posts, I outlined methods for running tests remotely and that has proven to be very useful. In order to test this code and continue developing it (without windows mobile or a working android build yet), I have developed a simple python test-agent that can run on a linux box (including n900.) If you are curious, check it out and watch tests run remotely…it is pretty cool. So the real problem I need to solve is how to not run a list of tests on a mobile device. Solving this could get us to green faster and reduce the mochitest runtime in half! In 2008 my solution was Maemkit. Maemkit is just a small wrapper around the python test runner scripts that does some file (renaming) and directory (splitting into smaller chunks) manipulation to allow for more reliable test runs. This has worked great and still works. Enter remote testing and we need to hack up Maemkit a lot to accommodate for everything. In addition a lot of the work maemkit does is already in the test runners. You can see I now can run or skip tests that are tagged ‘orange’ or ‘timeout’. Better yet, I can skip tests with fennec-results that match fail > 0 if I want everything to be green. You should now see the power of this filtering and that with some more detailed thinking we could have a powerful engine to run what we want. Of course this can run on regular mochitest (if you take the code in this patch from runtestsremote.py and add it to runtests.py.in) and run all the orange tests in a loop or something like that. patches checked in, tests can run on windows mobile! My previous posts on the status of winmo automation outlined a series of patches to land. I am proud to say all of those have been reviewed (thanks to everybody), have landed (thanks ctalbert for checking these in) and with the help of this buildbot shim script are running very well! Xpcshell: this is pretty straightforward. I don’t see any problems running this end to end as the harness by design only runs one case at a time. As a note, this is the only test harness that copies over the test files to the phone. sutagent: this is actually the backbone of these tests. This tool runs on the phone and has come a long way over the last few months. This agent is a product of blassey and bmoss. The next steps here are to get the code checked into one of our source trees. There are a few things we want to clean up, but overall we are at a great milestone on this project and ready to start rolling this out.